We’re proud to say that here at Corprotex Apparel we offer the best quality and designs that the UK has to offer in stock supported corporate clothing and business workwear for organisations with 6 or more staff. From Brook Taverner, we give you their Sophisticated, Performance, Concept, Corporate Fashion and Eclipse Collections, and from Club Class we give you their Everyone, Europa, Evolution and Endurance Collections. 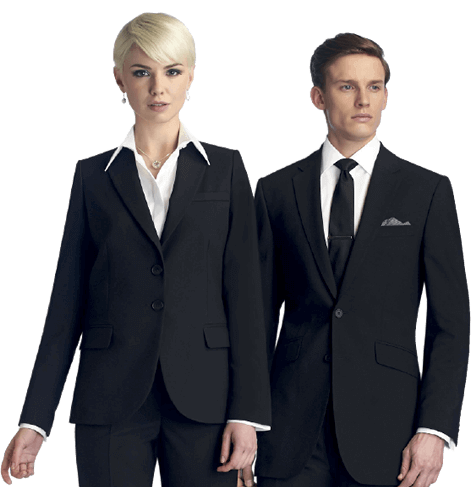 These high quality, smart and modern corporate clothing ranges are without doubt the best there is to offer in the world of stock business wear, leaving you spoilt for choice and able to mix and match any of the garments we have on offer. If however you’re seeking to introduce a bespoke corporate uniform, we take great pride in being able to offer that too. We have a highly skilled and experienced team working together from our premises in the heart of Manchester’s textile district who will be very pleased to work together with you to design and deliver you a custom work uniform or corporate clothing you and your team will be proud of. Looking to leave a lasting impression on those that come into contact with you and your people? Our UK stock supported corporate suits are available in a wide range of styles, colours and patterns that will help your business leave a positive impression with your customers and prospects alike. Our Manchester and Loughborough based account management representatives can help you select a range of corporate wear that is smart but subtle, is most suited for the needs of your team and reinforces your brand with the application of tax tabs. Whatever your particular needs, we will have a solution to suit you. Why cut corners? Make sure that your staff are never uncertain of what to wear with our business shirt and blouse collection. There are countless options to choose from, with over 100 different styles and a vast selection of colour choices for both men and women. Our UK stock shirts and blouses are wearable and easy to iron. Not only will your staff be happy, you’ll have a customer facing team that is super-smart and one that you’ll be proud of!